Are Granite Countertops Worth It? Should You Consider Recycled Material? The kitchen is often the heart of the home. 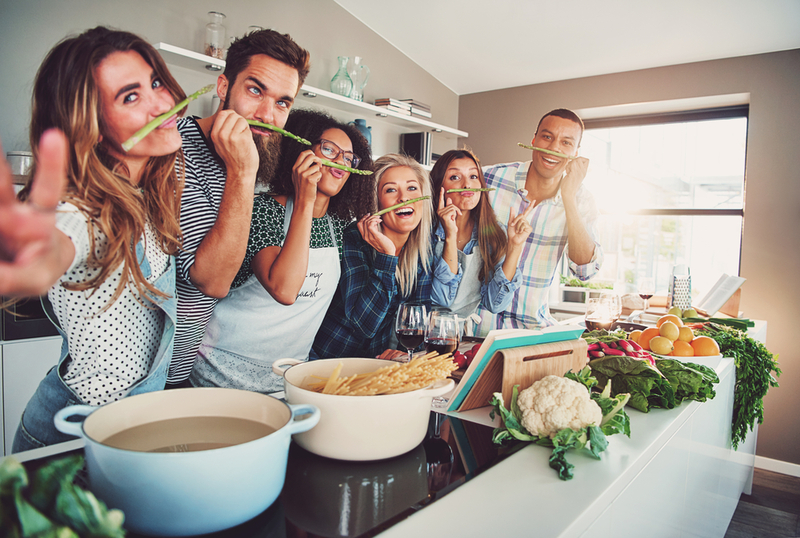 Avid cooks and recreational chefs are likely to spend much of their waking free-time standing up in the kitchen working on one of their experiments, while entertainers will make sure everything is perfectly arranged for them to take care of their guests. The kitchen tends to be especially important when it comes to family life. Aside from the traditional cooking and baking projects, family members visit for snacks and drinking water. For many families, the kitchen is also the center of household organization. 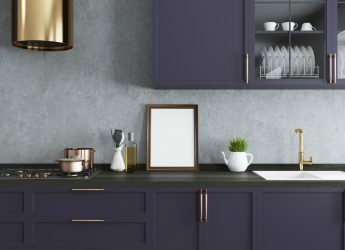 It’s no wonder that kitchen remodels are not only some of the most common and practical when it comes to updating a home, but also the most likely remodels to add value to a home. According to Remodeling Magazine, a minor kitchen remodel of around $20,000 is likely to return 81 percent of your investment while also offering a selling point for potential buyers. There are a lot of considerations that homeowners will have to juggle when doing a full kitchen remodel. That being said, taking a look at the materials and styles that are available will help you quickly whittle down your options and figure out what’s right for you and your home. Your first consideration when planning a remodel should be knowing how long you are planning to live in your house after the remodel. If you plan on selling within five years, then it’s best to stick with an inexpensive renovation that will make made your home’s existing features look excellent. Your remodel might focus on buyer-friendly updates, such as producing a low-carbon footprint and maintaining a high level of energy efficiency. It might even just need a cleaning and a decluttering to look nearly new! However, if you are planning to live in your home for seven or more years after the remodel, then it’s worth it to spend extra on new items and fixtures. You might want upgraded countertops, appliances, cabinets, and flooring, as long as these additions enhance your own lifestyle. The value, in this case, is the utility and enjoyment that you’ll get out of them. It will likely inspire you to cook for yourself and your family more. What are Your Remodeling Goals? Knowing what you want from your remodel will help steer you toward making the choices that will bring you the most value. Most remodels involve upgrades and updates, but you can also remodel to fix a problem, such as inaccessibility within your kitchen or even a color scheme that doesn’t complement the rest of your interior design. How Do You Want Your Kitchen to Function in Your Household? 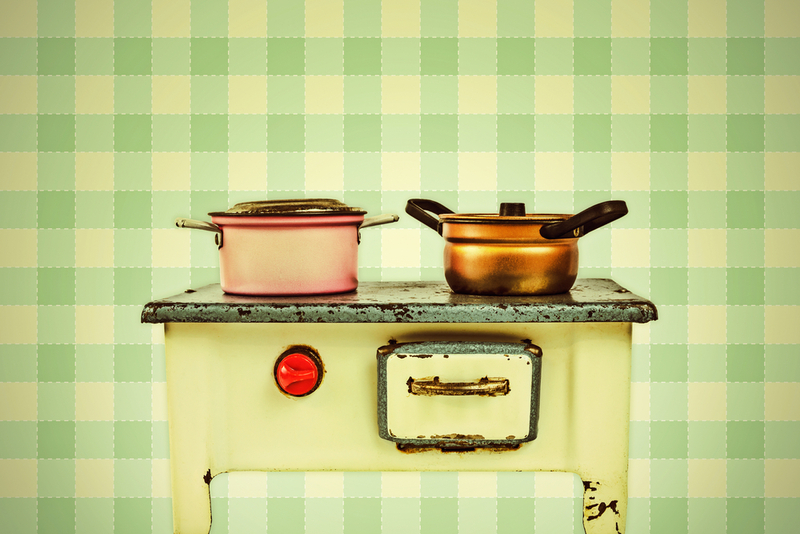 Different families and homeowners use their kitchens differently. Whether you use it for eating, as a gathering space, or another function on top of cooking, knowing your kitchen’s function will allow you to optimize its ability to fit your lifestyle. How Do You Want Your Kitchen to Look? Kitchen design dictates much of the atmosphere of your home. Lighter colors can make a floorplan feel more open, while unique touches such as stone floors and brass knobs can add a charming, rustic element. As you plan out your kitchen’s look, you should make it comfortable and inviting for you to spend your time in it. To figure out what you like, as well as what’s trending in the current market, look at design magazines and blogs for inspiration. Browsing is a low-risk way to narrow down your choices. What Fits into Your Neighborhood? 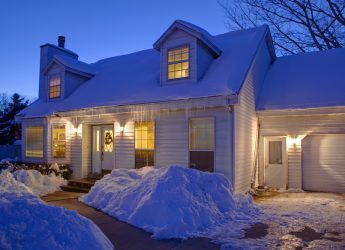 If you know that you’ll eventually be selling your home, it’s important to take into consideration the values around your neighborhood before investing in your remodeling projects. Generally speaking, your kitchen should fit in with kitchens in your neighborhood. Having an extremely overstated or understated kitchen could make your home’s salability suffer. The summer months tend to be the best time for kitchen remodels. Most homeowners prefer their remodeling to be finished by autumn to keep the remodeling stress from combining with holiday stress. However, the more important question is when will you be ready to do it? Any time will have its pros and cons, but if you’re unprepared, any time is the wrong time. 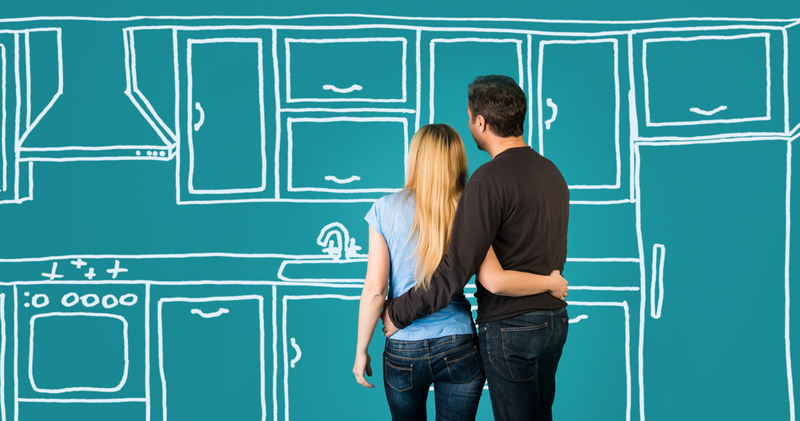 Homeowners who are planning to sell their house in the next five years after remodeling should plan to spend between 6 and 10 percent of their home’s total value on a kitchen remodel. This is the optimum range for being able to recoup remodeling costs in the sale value. Take into account how much you can reasonably afford to spend as well as your home’s overall value. A budgeting calculator, such as this one, can help you determine a reasonable budget for your house. Keep in mind that not remodeling certain aspects of your kitchen, for instance, if you already have hardwood floors or are happy with the cabinetry, will allow more important parts of your remodel to take a greater percentage of your overall budget. Online budgeting will only get you so far, and it’s important to consult local experts about the true cost of your renovation plans. When building your budget, keep in mind that professionals recommend homeowners keep aside twenty percent of the total cost of planned renovations for unforeseen issues. Unexpected problems could include plumbing, structural, or electrical issues, out of date wiring, rotting floorboards, pest control, or even difficulties concerning toxic materials. What’s most important to you? Flooring, installations, or the overall look and feel? Create a list of priorities. That way, if your budget starts to run out, you can make sure to get the most important things done and save the rest for later. It can also help to divide your list into needs and wants. Not all of your wants may make it into your final budget, but your needs should. Additionally, consider having backup choices to allow for flexibility, if you have trouble sourcing materials or you need to make budget cuts. Are you going to stay in the house during the remodel? Or do you need to relocate while the work is being done? Your budget should account for any hotel, moving, or storage fees. Or, if you plan on staying in your home while remodeling, the kitchen, plan for disruptions to your normal routines. For instance, you might factor in the costs of buying a hot plate, electric kettle, or other tools for simple cooking. You’ll also likely want to budget for purchasing more prepared foods and eating out. It’s not enough to talk about your budget or to give numbers to your contractor. You need to write it down and think about it. Making a spreadsheet is the best way to see where all the money is going. This will help you make redmodeling decisions while staying on point with your budget. Adding on sudden changes is a sure way to go over budget. First off, it will prolong the duration of your remodeling process, including the time you are unable to use your kitchen. It will also add installation fees, sourcing fees, purchasing fees, and any other costs required to implement the change. You can save money by knowing what’s important to you and keeping in mind that you don’t need to optimize absolutely everything in your kitchen. A few little upgrades that suit your lifestyle will speak for themselves. Not all of your appliances need to be top of the line either. For instance, a refrigerator will most often last fifteen years or less, even when technologically optimized. A stove will last much longer and is worth the extra investment. 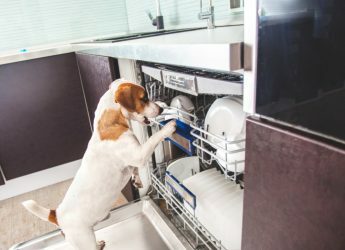 Similarly, if your family goes through lots of dishes, it’s worth it to invest in a high-performance dishwasher that won’t make you waste your time running a sponge back over your dishes. Granite counter-tops are more than a status symbol. Stone is extremely long-lasting and adds beauty and home value, especially when compared with laminate countertops. If you know you want granite but are fighting the costs, it’s worth looking into the different grades of granite. Grades of granite range from one to five, meaning rather than going with the most expensive grade five, you might find more value in investing in grade two. However, granite’s longevity only benefits you as an investment when you intend to live in your home for ten or more years. Attractive laminate surfaces are designed to look like granite and function well as a granite alternative. For many, the cost savings well makes up for not having granite’s heat resistance. You can also create beautiful effects by selectively mixing the two surfaces. For example, if your kitchen includes a center island, this is a good place to splurge on a statement surface, such as granite, wood, or glass. Then the rest of your counters can save your budget with a complementary laminate surface. Turning to salvage and antiques when remodeling is an eco-friendly and often financially friendly measure. Antiques will add interest to your kitchen with unique and uncommon pieces. Look for kitchen fittings such as wine rack trellises, flooring, paneling, and even cabinetry. However, depending on where you’re shopping for your antique pieces, recycled goods won’t necessarily decrease the price tag. Many recycled and eco-friendly products will cost premium prices. Recycled countertops tend to outprice their laminate alternatives, for example, look at Richlite ($45-$75 per square foot), a countertop material made of recycled paper and resin, or Icestone ($50-$80 per square foot), a countertop made of cement and recycled glass. These are cases where choosing the eco-friendly or recycled option will cost you more than less eco-friendly alternatives. We don’t recommend purchasing antique or recycled appliances for functional use in the kitchen, as the technology involved in kitchen appliances has increased their performance even in the last five years, and performance, as well as efficiency, are liable to suffer in older models. Doing your own installation and replacement will save you a lot of money on contractor labor. And even easier than installation is demolition, such as pulling out old cabinetry, getting rid of appliances yourself, and tearing out old flooring. However, you should be careful taking on a project that exceeds your skill set. A botched DIY project means that you could end up spending more to get the job done. To save some money, ask your contractor about any purchasing costs that he or she may charge. In some cases, it might be worth it to purchase materials yourself. In other scenarios, your contractor’s wholesale pricing will be advantageous. When it comes to plumbing, electrical work, and gas lines where there’s a lot that can go wrong, we recommend always hiring a professional. Installing new cabinets normally takes thirty percent of the average remodeling budget for a full kitchen. 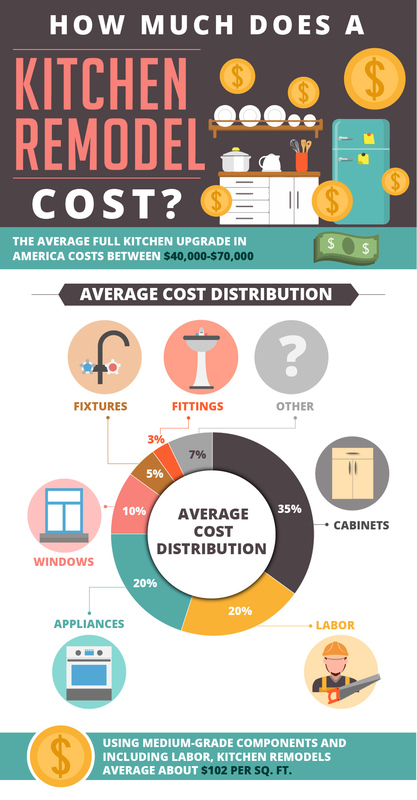 Many kitchen renovations can cut this cost by upgrading the existing cabinetry. Refacing and resurfacing are ways of sprucing up your cabinetry so that they look new and updated. Cabinet Refacing refers to removing cabinet doors, front panels, and any hardware that might be visible from the front, and replacing the covering with new hardware elements and a new wood veneer. Most contractors identify cabinet fronts as a good place to save on your renovations, as most people can’t tell the difference between wood veneer and real wood. Cabinet Refinishing refers to removing, sanding, and staining the doors and drawers of existing cabinetry to give them a new look. It is also possible at this point to paint them a different color to add fresh dynamics to your kitchen. LEDs come in a variety of tones from warm lighting to cool lighting in order to customize the mood and brightness of your kitchen. 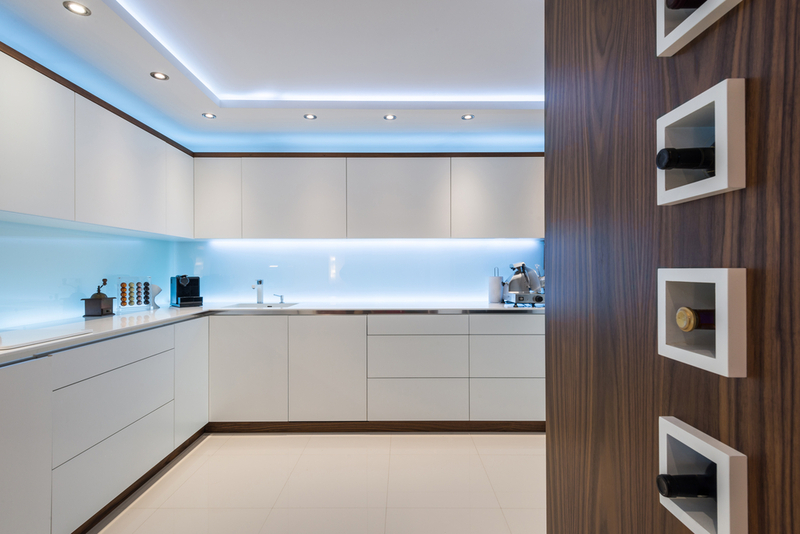 Under-cabinet LEDs are becoming a popular way of adding extra lighting into your home without the increased presence of light fixtures. Energy Star Appliances – Energy Star appliances save money in the long run by meeting or often exceeding government energy efficiency standards. 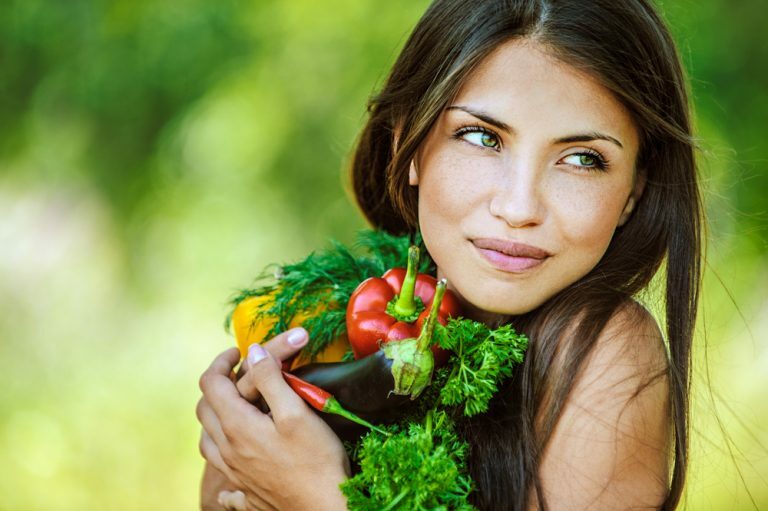 Kitchen Composters – Composting allows you to turn much of your food waste into fertilizer for your gardening and landscaping needs. Induction Cooktops and Gas cooktops – Both induction cooktops and fast-boiling gas cooktops produce less energy waste than traditional coil ranges. Efficient Dishwashers – The right dishwasher can save more water than handwashing your dishes would. Smaller Appliances – Small appliances not only fit into tight spaces, with smaller heating and cooling footprints, but they also offer energy and water savings. Additionally, many of these micro-models are high performance to justify their smaller stature. Storage additions to your cabinets are likely to cost you. This includes semi-custom additions, such as rollout trays, extending the cabinets to the ceiling, and extra shelves. 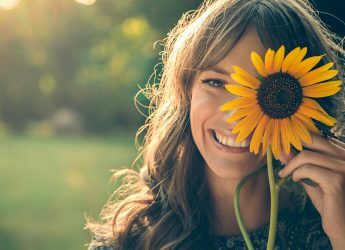 While many will find them to be worthwhile purchases, you’ll want to have these additional costs planned into your budget so that they aren’t a surprise. Functionality is a good splurge for your home. Prioritizing your kitchen space means putting the things you are most likely to use in the easiest to reach spots. 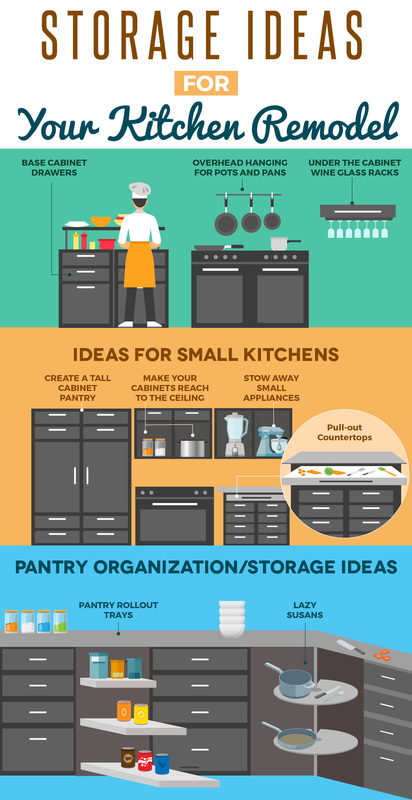 This means that meal planners should have meal storage and proportion supplies close by while bakers should have easy access to baking tools and pans. 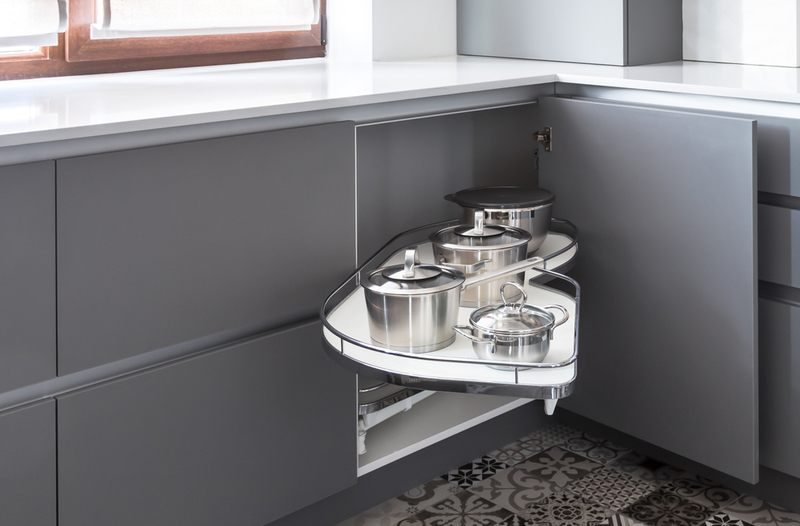 Kitchen space priorities will be different for every household, but there are a few common ways to make storage easier on yourself. Many homeowners, frustrated with pots and pans hogging all their storage, have taken a cue from culinary professionals and installed bars on their ceiling to hang their cookware. This is a great fix to air dry cookware or show off beautiful copper cookware. Taking a cue from the professionals again, in this instance bars, many homeowners have freed up their cabinet space by installing special racks to hang their stemware. These can be hung under cabinets or wet bar shelving. 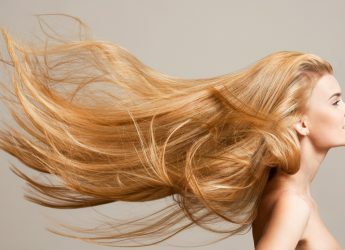 This allows for easy access and air drying. When you cook a lot, you know how important having a lot of prep space to be able to stretch out into can be. However, prep spaces aren’t always useful to us when we aren’t cooking a large meal, and they might even get in the way and take up valuable kitchen real estate. Pull-out counters give you the extra space you need without permanently blocking up your kitchen. To maximize the storage space you get out of your cabinets, use custom or semi-custom options to make them reach all the way to the ceiling. Since many small kitchens don’t have space for a pantry, you can create a pantry by adding a tall cabinet with adjustable shelving to the end of a run of cabinets. Cluttered counter-spaces can make your kitchen feel smaller than it really is. Hide away small appliances such as blenders and food processors until you need them. Pantry organization is an ongoing battle for most families, as packaging and items are often placed throughout the pantry willy-nilly. Many pantries become disorganized because they don’t offer the ideal accessibility to the most important items and ingredients. A few pantry installations that you can add during your kitchen renovations will help to make your stored items easier to grab and also easier to put back into place. Lazy susans allow you to use the full depth of deep storage spaces while also offering you the accessibility of being able to rotate items to the front to easily grab them. Rollout trays allow you to safely pull out your pantry shelving as if they were drawers for easier access to items in the back. 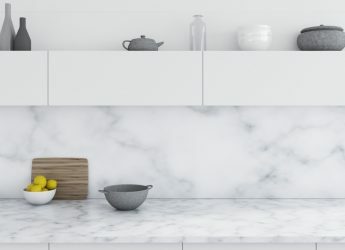 Countertops are often a focal point in the kitchen, but homeowners should also consider durability, longevity, amount of use, and ease of cleaning and maintenance when picking countertops. Concrete ($75-$125 per square foot) is growing trend that gives kitchens a modern, formal appearance. Concrete comes in a wide array of designs including stamping, polishing, and acid-staining. Concrete counters are durable and heat resistant, and you can customize them to perfectly fit your specific surfaces. However, concrete requires regular maintenance to remain sealed and polished. Laminate counters ($15-$40 per square foot) are the most affordable material available for countertops. Laminate comes in a large range of colors and styles, which can look like more high-grade materials. These countertops are low maintenance and durable, but they can be damaged by knives and hot pans. Formica ($16-$27 per square foot) – Formica is a laminate countertop that is known to be budget-friendly and easy to install. However, Formica counters are prone to burns and scratches, and they do not last as long as more durable counters. Stainless steel ($80-225 per square foot) countertops and other metals allow you to cook like the professionals. Metal countertops are durable and easy to clean, as well as being heat resistant. However, they are easily prone to scratches. Price variations determine thickness, finishes, and coating which can protect the surface from scratching. Serious cooks might opt for the premium stainless steel counters, but mid-range will work well for most homeowners. Paper composite ($30-$80 per square foot) is environmentally friendly, as most of the paper is sustainably sourced from FSC-certified forests or post-consumer recycled paper. Since paper composite is sealed with resin, it is durable, non-porous, and easy to clean and install. However, it can show long-term wear and tear like scratches and stains. In addition to being eco-friendly, glass countertops ($50-$125 per square foot) tend to be a statement piece that will tie together the aesthetic of your kitchen. They can be colorful and jewel-like with bright matching backsplashes. Their non-porous surface is heat and stain resistant, as well as easy to clean and maintain. 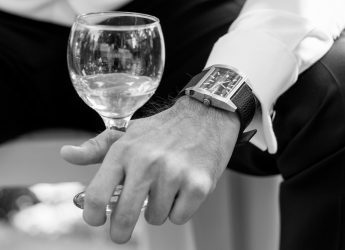 On the downside, they may show wear by chipping or scratching from accidents involving knives or slamming heavy equipment, or pieces of glass may chip out on the edges. Solid surface counters are developed from tough acrylic and refer to materials such as corian and formica. Solid surfaces come in attractive finishes and can be less expensive alternatives to natural materials. These counters are seamless and durable, but they are subject to potential burning and staining. Since these countertops are expected to have less longevity than most natural materials, ordering a nice mid-grade will offer better value than the highest grade materials. Corian ($42-$65 per square foot) – Corian is made from combining minerals and acrylics. It comes in a wide variety of colors. Corian is less long-lasting than a stone like granite, and scratches and cracks are common over time. It can also be damaged by heat. Stone countertops include high-end marble, quartz, slate, soapstone, and granite. They are durable and heat-resistant. Stone countertops are an investment due to their longevity. For instance, quartz and granite can last at least fifty years. Stone countertops do require regular maintenance and may show wear by chipping. Granite ($50-$200 per square foot) – Granite countertops are made from natural stone. Granite is fully heat resistant. Quartz ($50-$150 per square foot) – Quartz countertops are engineered and artificially colored. Quartz is elegant and durable, but less heat-resistant than granite. Slate ($50-$65 per square foot) – Slate countertops have a beautifully simple appearance and require less maintenance than other natural stone, with the exception of granite. Soapstone ($60-$185 per square foot) – Soapstone offers a finished natural stone with a less formal appearance than granite and low-maintenance, long-lasting durability. It works wells in a country or more rustic style kitchen. Lava Stone ($250 – $300 per square foot) – Lava Stone countertops are high-end conversation pieces to wow their guests with something different. Lava stone is very heat resistant, comes in a wide range of colors, and will last a lifetime or more. Limestone ($55-$125 per square foot) and Travertine ($50-$100 per square foot) – Limestone and travertine are both beautiful aged stones. However, limestone is known for being soft, meaning it will take a lot of wear and tear and is likely to scratch or chip over time, while travertine is more durable. Both limestone and travertine are also higher maintenance, requiring sealing and care. Porcelain countertops ($60-$100 per square foot) are even stronger than granite, heat resistant, light weight, and unlikely to chip. It’s low maintenance and easy to clean. Slabs of porcelain will make an elegant modern look, but porcelain tiles will save you money when compares to slabs. Tile countertops ($18-$35 per square foot) are inexpensive and are a frequent DIY project for the handy homeowner. Depending on the chosen tile, tile countertops can be heat resistant and durable. But they may be susceptible to chipping and scratching. Regular maintenance, like grout sealing, will keep it so that the tile countertops are easy to clean. Tiles allow easy customization to a homeowner’s personal taste since tile patterns and designs are varied and flexible. Wood countertops are frequently chosen for their aesthetic appeal and ability to bring warm tones into the kitchen. Wood is a long-lasting natural material that is durable and able to withstand scratches and burns. Bamboo ($40-$95 per square foot) – Bamboo is considered eco-friendly due to the quick maturation of bamboo and its use of a renewable resource. Bamboo countertops tend to be easy to clean, but they are liable to show wear and tear, such as burns and scratches. You can save more money on bamboo counters by purchasing a standard grade as opposed to premium, since either price point will weather regardless. Reclaimed Wood ($115-$300 per square foot) – Reclaimed wood is an eco-friendly and sustainable wood option that creates gorgeous and long-lasting countertops. Reclaimed wood countertops are costly and require maintenance when it comes to sealing and polishing. Wood or Butcher Block ($55-$200 per square foot) – wood and butcher block style countertops vary widely in price depending on your chosen wood and quality. A more expensive wood will have great longevity and style. Middle-grade products will get you through ten years or more, for those who anticipate selling their home in the future. Installing pre-fab butcher blocks can also cut down on the costs for a handy homeowner. Kitchen cabinets can either be a standard size and shape or be made completely custom to fit your kitchen spaces. Base – Cabinets storage underneath the counter. Wall-mounted – Cabinet storage mounted above the counter. 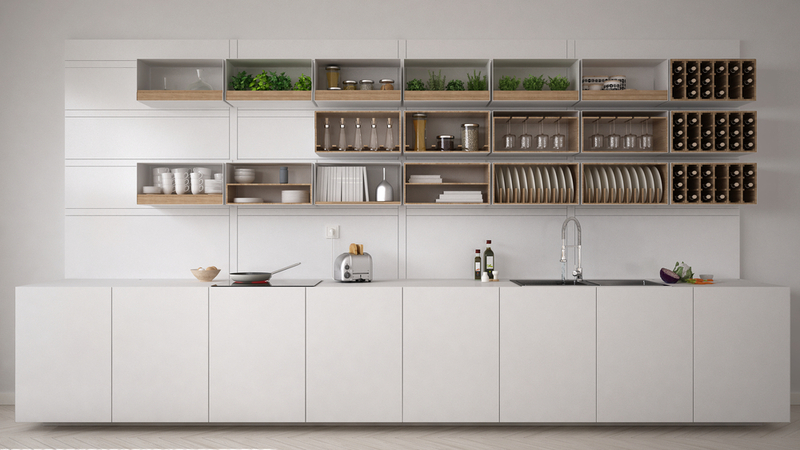 Tall – Cabinets that stand from the floor to the height of the wall-mounted cabinets. These are often standalone or used as pantries. Corners – Cabinets that use roomy corner spaces, often outfitter with lazy-susans or used for out of the way storage, due to their large but less accessible spaces. Hutches – Open or glass-door shelving on top of a lower cabinet unit, often used as a chest for tableware or display. Bottle Racks – Built-in bottle trellises that often go about the wall cabinets or fridge. Stock Cabinets Stock cabinets are the least inexpensive cabinet option. They are premade and sold in store, making them convenient and quick to obtain but limited in design and sizing. When it comes to choosing stock cabinets contractors recommend plywood over particle board, as well as having your cabinets professionally installed to save you a lot of trouble. Semi-Custom Cabinetry Semi-custom cabinets come in standard sizing but it is possible to resize drawers and door fronts as well as change cabinet depths. Custom Cabinetry Custom cabinets are made to order to look and fit perfectly into your home. This is the most expensive cabinet option, and will often require hiring a skilled carpenter to create them. While appearance is a big part of picking your flooring, choosing the best flooring for your kitchen is also a consideration of comfort and padding, durability and longevity of material, and ease of cleaning and maintenance. Ceramic tile ($1-$8 per square foot) floors are strong and durable, but may chip or crack. Furthermore, tiles offer you a wide variety of colors for customization. The downside of tile floors is the possibility of chipping cracking. Porcelain tiling on floors best resists chipping and cracking, while ceramic tile is better for backsplashes. 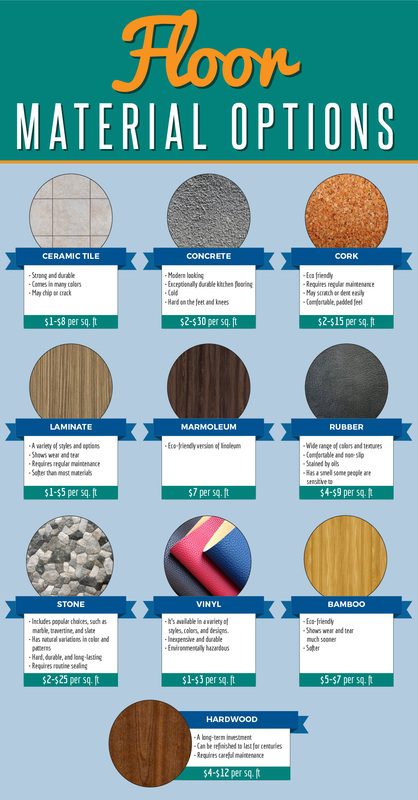 You can cut your installation and maintenance costs by picking larger tiles for flooring. Concrete flooring ($2-$30 per square foot) offers a modern and exceptionally durable kitchen flooring with an easily customized look. It can be stamped, stained, stenciled, and waxed, and offers a great surface for area rugs and carpet tiling. Concrete is cold, and can also be hard on the feet and knees for standing long periods of time, so many will use cushioned mats at prep and cooking stations. Cork flooring ($2-$15 per square foot) is considered eco-friendly since it is renewable. Cork flooring comes from stripping the bark off a cork tree and then allowing it to regrow before stripping it off again. It is mildew and stain-resistant, but it does require regular maintenance and may scratch or dent easily. It offers a comfortable, padded feel for walking and cooking, and it naturally insulates against temperature change and noise. Laminate flooring ($1-$5 per square foot) is inexpensive, and it offers a variety of styles and options. Popular among these styles are textured wood designs. However, laminate flooring shows wear and tear and requires regular maintenance. Laminate flooring is also softer than real wood, offering cushioning to the feet and knees for prolonged periods of standing. Marmoleum ($7 per square foot) is an eco-friendly version of linoleum made from materials such as linseed oil and natural pigments. Rubber flooring ($4-$9 per square foot) comes in a wide range of colors and textures, including cushioning for the feet. It’s durable and easy to install, as well as being non-slip. Rubber flooring may be stained by oils, and may have a smell that some individuals are sensitive to. Eco-friendly options, such a recycled rubber are also available at less premium prices. Stone flooring ($2-$25 per square foot) includes popular choices, such as marble, travertine, and slate. The natural variations in color and patterns give can give a kitchen floor a unique, formal, or in some cases rustic look. Stone can be an expensive option, but it is hard, durable, and long-lasting. Some stone flooring is more fragile than others, therefore requiring routine sealing and precautions from chipping. Vinyl flooring ($1-$3 per square foot) can refer to sheet vinyl, vinyl tile, and vinyl plank. It’s available in a variety of styles, colors, and designs. Vinyl is inexpensive and durable, such that it can handle moisture, and does not scuff or scratch easily. However, vinyl is among the most environmentally hazardous consumer materials produced, and it can emit Volatile Organic Compounds (VOCs). Wood flooring includes hardwood floors, bamboo, and engineered wood. Wood flooring is attractive, classic, wear-resistant and durable. It does require regular maintenance, including oiling to prevent cracking and sealant. Bamboo ($5-$7 per square foot) – Among wood flooring, bamboo is considered to be the most eco-friendly. However, bamboo shows wear and tear much sooner and is softer than other wood flooring. To get the best quality, go with the bamboo flooring with the longest warranty you can find. Hardwood ($4-$12 per square foot) – Hardwoods are desirable to most homeowners and homebuyers, and they are an investment that can add long-term value to your home. Hardwood flooring is beautiful, natural, and can be refinished to last for centuries. However, they require careful maintenance, since they are difficult to clean and are easily scratched. They are also liable to warp or buckle from long-term moisture. Your kitchen’s backsplash is a great space for you to exercise some of your creativity and flair. The backsplash not only protects the walls but it also ties together the look of your kitchen. While some will elect to extend their countertop material up the walls, this is often a pricey option that also limits variety in the kitchen’s look. Most homeowners will use tile for the backsplash. This includes ceramic, porcelain, and glass tiling, and in some cases a mixture of several of the above. Interesting effects have also been done using smooth stones, and other textured materials, including sea shells, to create mosaic patterns, depending on the theme of the kitchen space. 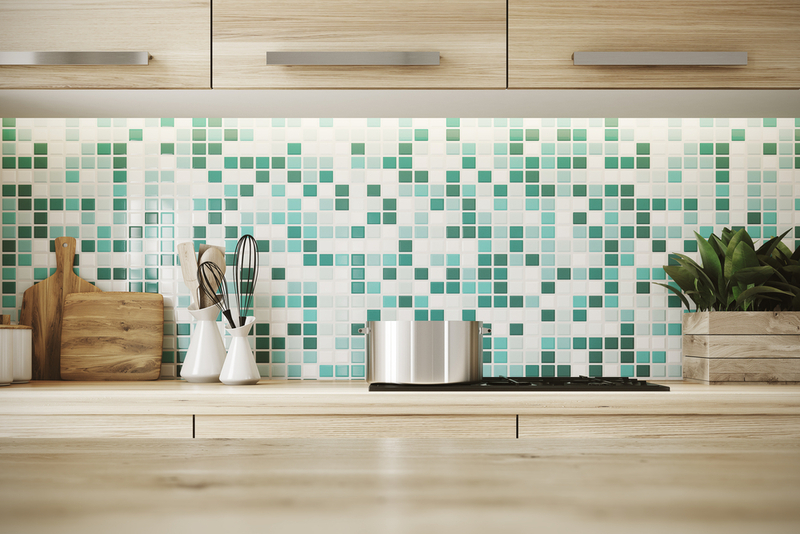 When picking colors for your backsplash, one rule of thumb is to match colors, but vary the texture. Others, though, will use the backsplash as a bright accent point in an otherwise neutral kitchen. It can help to compare paint chips on the wall of your color theme to help you decide what will go. Warm tones in the kitchen will give your home a cozy feel, cool tones will calm, and bright colors will energize. Energy Star appliances will cost a little more, but they are appliances that the U.S. Department of Energy has marked as energy efficient. This means that they will offer energy savings while lasting longer than lower end appliances. Custom appliances are more coherent with the design and function of your kitchen. 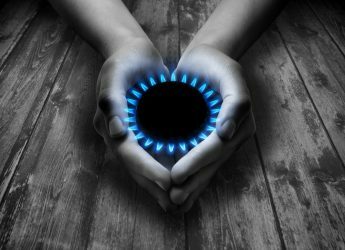 These will often be built into your cabinetry, such as a gas cooktop built right into your countertop, and electric oven built into your cabinetry at eye-level. Or they might be panel-ready, meaning they are camouflaged with the same external finish as the rest of your cabinets. Because they are custom-built into your floor and cabinet plans, they will likely take up less floor space, but they are often much more difficult to change or adjust when it comes to a future remodel or selling. When it comes to function, customizing appliances refers to building an appliance to suit the needs of your household via manufacturer options and specifications. Customizations include colors, door styles on refrigerators, and eye-placement on ranges and cook-tops. High-end appliances offer technological advances, such as Bluetooth-capable smart appliances. The general consensus among experts is to save the smart-ware and bluetooth capabilities for small appliances where they can greatly enhance your cooking skills. However, for big appliances that you want to last ten to twenty years, most predict these technologies to quickly become outdated and either be replaced with new technologies or lose support from their companion applications. There are a number of factors that go into buying luxury appliances, including design, professional-style cooking ability, and products with strong brand support, brand recognition, and long-lasting materials. While pricey, some are developed with a specific cooking style or implementation in mind, such as steam-injection ovens for bread baking or top end wine refrigerators. Lower-end appliances are not guaranteed to last for a long time, especially if they are bought used. However, budget outlets can offer great deals on models that are sold at lower prices because they have been a little dinged up in shipping or have been used as a store floor model. Small appliance choices tend to be based on individual lifestyle. 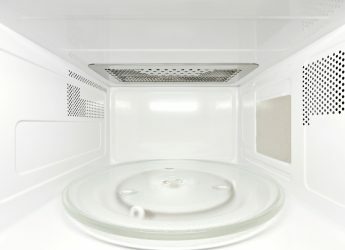 There are a few staples that most households have in some form or other, including microwaves and toasters. However, aside from an over-the-range microwave, built-in small appliances are generally a bad investment for those looking to sell in the near future, as they limit the flexibility of the kitchen space. 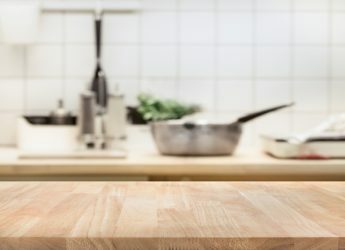 For instance, some households will make frequent use of a juicer and stand mixers, while others would prefer an espresso maker or electric kettle. 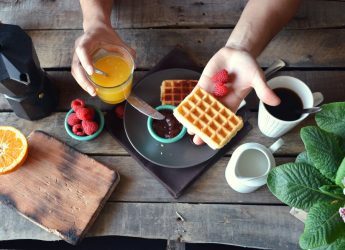 Limited-use appliances, such as waffle makers, bread makers, pasta makers, and ice cream makers are fun choices for the right household that will use them. DIY projects often dominate kitchen renovations, as they allow homeowners to customize spaces to their ideal functionality within the home. Numerous DIY tutorials exist for optimizing your kitchen space to your needs. A peg board is a great place for hanging the items that you need and use every day. An added plus to using a peg board is the ability to narrow down the amount of horizontal space that you use for drying dishes, as many things can be hung on the peg board to dry. 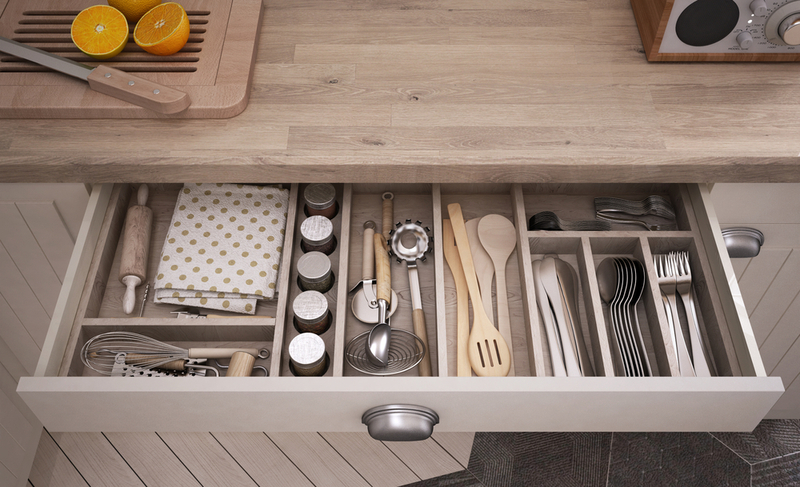 Unorganized kitchen drawers are among the most frustrating parts of getting into your cooking flow. 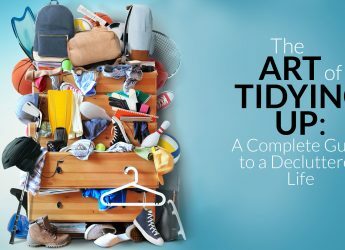 Tools that are supposed to make life easier are liable to get stuck or go missing in unorganized drawers. This easy DIY Utensil Drawer Organizer allows you to make a customizable insert to perfectly fit your own tools and needs. Kitchen islands offer extra prep space, as well as being useful for bar seating in a pinch. While building in a kitchen island can be a pricey renovation, at around $4,500 on average for eighteen square feet, building your own kitchen island cart can add complementary variation to your kitchen space while giving you the horizontal spaces that your kitchen needs. For all its organizational and storage virtues, having a lazy susan professionally built into your cabinets or pantry will cost you around $75. Fortunately, making a lazy susan is a relatively easy DIY project for someone with a drill and some hardware. Pot racks are amazing space savers, but not everyone’s pot rack will look exactly the same. What saves space in one home might waste space in another. 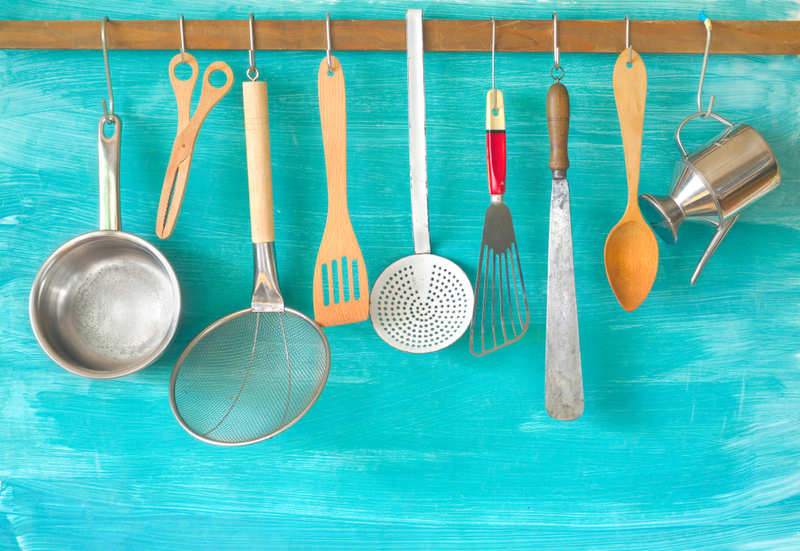 Experimental homeowners have made pot racks out of everything, from a bicycle wheel or ladder to curtain rods, wire racks, and piping, all according to their own storage needs. If you’re worried about looks, new hardware, including knobs and drawer pulls, can completely update the appearance of the entire kitchen. Not all of your metals have to match. For instance, you can have a chrome faucet with pewter or bronze handles and door pulls. Tastefully mismatching metals can add uniqueness to your kitchen’s design. In many cases, old tiling can offer a timeless, rustic, or cozy look. But sometimes old tiles suffer from dirty, chipped, discolored, or even moldy grout that makes them less attractive than they really are. Rather than replacing the whole set-up and costing yourself pricey materials, you could replace the grout, thus reframing your tiles in a new and beautiful way. Cleaning and detailing is a great way to do the work yourself and save some money on your kitchen remodel. Rust removal and using rust-proof paint are both ways of renewing an older space with a little bit of elbow grease and know-how. Kitchen remodeling asks you to plan ahead to maintain a balance between what will be functional in your household and what will also create the best living space for you and your family. Standard designs are available for those who are planning to renovate in order to sell their home in the next few years. But for those remaining in their homes for the next ten or more years, the remodeling decisions can get much more personal. Investments in storage, long-lasting floors and countertops, and versatile cabinetry will help work towards creating the optimal kitchen space for your household. 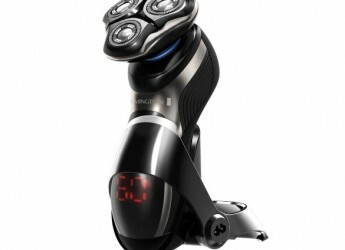 This article is very informative, it contains good information about home appliances.